During the short time that I had to wait, my attention was attracted by two vibrant voices which came to me from the net room, the door of which was slightly ajar. I could not see the speakers, and was convinced that the patriarch was not with them. Then the door opened wide and two men emerged. One, young and vigorous, I was later to know as a Chicago voice teacher of considerable reputation and unusual modesty, still active; but imagine my amazement to learn that the other clear voice belonged to an elderly man, quite bent and infirm, who's feet dragged a bit as he walked across the room. Since Schoen-René met Garcia in 1891, and Root's meeting with Garcia as recounted in the article below was in 1894, it is conceivable that it was not Root's first, is it not? But back to Stark. He quotes Garcia to make the point that the great maestro didn't concern himself with what he calls 'resonance imagery', which in old pedagogies would have been called 'voice' or 'tone placement'. And while I can see why Stark would conclude this from Garcia's statement, it does not entirely settle the matter. Why? There is evidence to suggest otherwise. Of immediate interest is Schoen-René's teaching which has been repeatedly addressed on these pages. There is also an explicit statement in The Encyclopedia Americana by Herbert H.Tubbs—who was a student of Manuel Garcia and Francesco Lamperti—which contrasts the teachings of the two schools, and in doing so, reveals that the Garcia School concerned itself with 'tone-placement'. It is worthy of remark that although earlier teachers were obliged to walk by faith rather than by sight they had not gone far from correct ways. Nor did Garcia's discoveries add much knowledge. It permitted him and his followers to move with greater certainty. 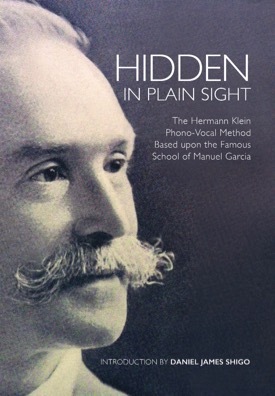 It led to the formation of vocal method on the idea of tone-placement. The registers of the voice assumed more definite position as factors in method. Whether Garcia became so interested in the scientific action of tone production and its reflection in chambers of resonance, as to obscure his views of respiration, or whether he became convinced that respiration was not important, does not appear. But he ignored very thoroughly that which was fundamental in Lamperti's work. This suggests that Garcia thought that the cavities in the head reflected the tone from the larynx even though one could not (as he suggests in the article below) consciously direct a stream of air there. Without knowing Garcia's understanding of the mechanism of reflection, we do know Root's own instruction from Luigi Vanuccini (another well-kown Old School pedagogue) is very much in keeping with Schoen-René's. Both deal with voice placement in the same way, that is, both taught that it involved the face, specifically the area of the nose and eyes. Of course, the question remains: did Manuel Garcia and his sister Pauline Viardot-Garcia teach this? The original article cited by Stark is below, along with a subsequent one which clarifies an important point. The personages involved read like a Who's Who of Voice Teachers. Of special note is the teaching of Francois Delsarte which swept through America like a wild fire, as well as the 'first' exercises of the Old School, which, even in Root's time, were falling away. 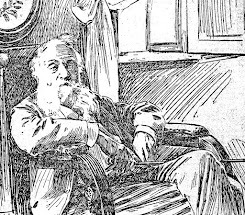 Mr. Frederic W. Root is the eldest son of Dr. Geo. 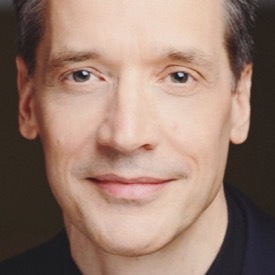 P. Root, the well-known American composer, and has been settled for twenty years or more at Chicago, where he now occupies a foremost position as a voice-trainer. What that position is and how firmly established is best proved by the fact that he has been taking a year's holiday in Europe in The company of Mrs. Root and their three children. This holiday is just closed, and we were fortunate to catch him just before he sailed for the States, and gather some of his interesting observations on vocal culture in Germany, Italy, France, and England. "Matthew Arnold says that culture is the knowledge of the best that is thought and done everywhere". You have been enjoying a musical experience of that kind lately, Mr. Root," we remarked, “and an account, of it must be interesting." '”My aim," said Mr. Root, "has been to observe the ideals and methods of voice culture in the different countries I have visited, selecting for observation that which is reputed to be the best or the most distinctly national and representative in each. In matters of theory I have found much conflict and contradiction; and in matters of practice, much diversity. But that was to be expected. The task I set myself was to seek beneath the superficial differences, which are notorious, the fundamental truth which all who are most successful must reach by one reason or another, and present to the learner by this or that name. For instance, within the past few weeks two teachers of world-wide reputation have stated to me the well-established fact that during the omission of pure tone the flame of a candle held before the mouth will not flicker, adding the opinion that this pure tone is obtained by a certain control of the breath, but differing radically as to how this breath was to be controlled. The investigator is not justified in assuming that one of these eminent men is au ignoramus, which he must do if he accept unconditionally either theory. But, of course, where there is radical difference of a statement there must be a degree of error somewhere. In this instance the aim of the two regarding the tone is identical, and both can do the thing proposed successfully, each in his own way. For practical purposes neither is wrong; the error must, therefore, be in the statement that pure tone depends mainly upon this or that management of the breath. The essential truth is to be sought elsewhere. Further proof of this particular fact, is that while, of course, all the best teachers aim at pure tone, the majority of those, I have found, place little stress upon breath management—and I am citing only those teachers who are considered as authorities. "Another set of superficial differences among these teachers which drive the investigator to seek a fundamental truth in some other direction, is regarding the sensation of tone, especially for high notes. One says that the tone must be felt in the forehead; another, at the roof of the mouth: another, behind the bridge of the nose; another, at the crown, of the head; another, about the eyes; another, at the back of the neck; another, in the region of the ears; and another, in the cheek bones—I quote only actual statements, made to me recently. All these sensations are helps, doubtless, to one or another among students; but one can hardly fail to see that they are all mere changing shadows of some strong, decided action elsewhere. Every teacher wishes to secure upper tones that are free from pinched, throaty, or muffled conditions; A succeeds in this by "locating the tone" in one of these places, B in another, and C in still another; all of which goes to show that the fundamental truth regarding the production of the upper voice docs not lie in this direction. And so on with registers and the other points of vocalisation; one can eliminate much that is non-essential by observing where equal authorities contradict each other, at the same time one is confirming what is important by noting points of agreement." '"Are there many of these points of agreement?" "No; very few, except in such everyday matters as pitch, pronunciation, &c."
"That would indicate something like chaos in voice teaching?" "1 think not. To me it means that the really vital considerations in voice production are few. In fact, I have come to believe that there is just one item of the vocal process upon which the efficiency of all the others depend." "'What is that?" "It has never to my knowledge been fully defined. It is indicated by such terms as 'correct placing of the tone,' 'proper resonating of the voice,' 'bringing the tone to a focus.' &c.; but those terms explain nothing, and are often quite misleading. The old Italians must have understood this principle thoroughly, but they had not the habit of explaining things. All the most successful teachers that I know work principally upon this point, which, however, is often hard to recognise under its numerous aliases. The best German teacher that I found, Herr Haag, of Munich, fancifully calls it 'putting champagne in the tone.' The best term I know for this prime essential is in the Delsarte classification of vocal resource which I got from Delsarte's pupil, Mens. 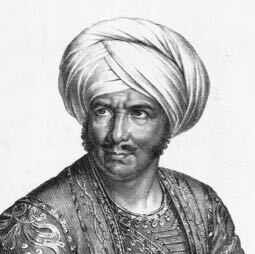 Alfred Giraudet, professor of Grand Opera at the Paris Consorvatoire. This term is normal (or moral) voice, which, when understood in connection with what he calls eccentric (or vital) and concentric (or intellectual tone), is luminous with meaning. I do not know how practical may be M. Giraudot's methods of bringing pupils to a realization of the Delsarte formula; I had no opportunity to judge of that. But upon thinking over what this eminent French teacher told me, I have come to consider it the most valuable thing I have found on my tour." "Is not this normal voice simply another term for good tone, that all the teachers are working for?" "How does M. Giraudet explain these terms?" "In compact form and without viva voce illustration I fear I can give but an imperfect idea. The eccentric voice is that which in men is the open chest register, and in both male and female voices is the tone which seems to be lower in the throat, and to vibrate more in the chest. Delsarte also called this the vital tone. The concentric tone is lighter, somewhat falsetto in character, and has the sensation of being up in the head. A person who pours out his emotions, who reaches out from himself as much as possible, will naturally express himself with the eccentric tone. The one who retires within himself and is reflective uses naturally a tone which has the other characteristics. From the normal the singer can proceed by perfect gradations to the eccentric or concentric tone. Another Delsarte term for this is 'moral tone,' which, like the normal, is a centre having variants associated with it, named the vital and the intellective. The vital is mostly an expression of the passions and the feelings, and the other is the medium of the intellect. Anything which is moral has a good balance of the heart and the head; the impulses are strong, and the head gives the right direction— that fact illustrates the value of this name for normal tone. The vital element is strong and demonstrative, but needs the reserve, the balance of the intellective element. The two united make what is so well called the moral tone. These terms are useful especially when speaking of the break. Voices often pass from one extreme to the other, from eccentric to concentric. If the voice is normal through the transit, there is no break. If the vital and intellective blend in the normal there will be no sudden and awkward change." Who of the teachers you have met are especially successful in getting at this 'normal' tone?" "M. Masson, the only one of the Paris Conservatoire professors who does elementary work with voices, uses the stroke of the glottis and a method of breath support, the principal feature of which seems to be to make the breath effort lower and lower as the voice ascends. This, with injunctions to keep the jaw relaxed and the brows calm, results in a condition of throat favourable to normal voice. Seven or eight of his pupils that I heard could all make their runs, &c, loudly or softly with equally good timbre. Still more specifically directed at this point are the instructions of Herr Haag of Munich. He directs that the tone be held by decided muscular action at a point somewhere behind' the bridge of the nose. This muscular action he calls the 'spannung,' and it is manifested by visible contraction at the sides of the nostrils, often resulting in two slight indentations at that part of the face. Signora Castiglione, of Milan, seemed to me to have a clear conception of normal tone (though not by that name). 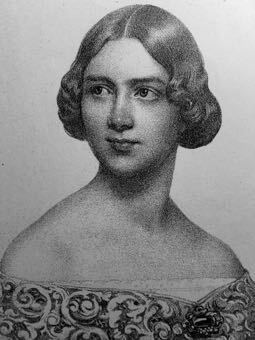 Her pupils strive to hold their upper tones by what seems to them a muscular effort in the head; they call it a ' closing'—not meaning covered tone—and one who cannot get a good upper note remarks, 'I can't yet close it.'" "How would you compare Germany and Italy as to their advantages for a vocalist's education?" "The sphere of genuine musical inspiration is much stronger in Germany than in Italy. In Italy their extremes in the matter of expression and their exaggerated style strike one as shallow and conventional, whereas in Germany one generally finds a genuine, deep, musical inspiration. The German ideals with regard to quality of tone, however, are much inferior to the Italian. The Germans will even sacrifice intonation to declamation; and easily overlook poor quality of tone in an otherwise musicianly singer. But the singing must be warm and intelligent in sentiment, and the words must be clear. In Italy there is musical talent enough, but the exaggerations of style I consider pernicious. I heard the singers of five opera houses, and not one in a prominent part was free from tremolo, often so strongly marked that the tone of the scale intended could hardly be distinguished except by the harmony. At a concert in Milan I heard a tenor who pleased me very much. He had no tremolo and phrased delightfully. At the close of his song I expected the audience to share my enthusiasm, but his singing fell dead, whereas others who showed excessive tremolo, mannerisms in cadences, cheap superficial effects, and extremes in every way, were encored and applauded to the echo. A great many English vocalists go to Italy, and, while they have a fine ideal of tone quality placed before them, they are under the harmful influence of this exaggeration, and they imbibe more or less of a style that is unpopular with us. The three professors of singing at the Milan conservatory, Signor Giovanini, Signor Leone, and Madame Vaneri-Philippi, to whose courtesy I was indebted for valuable opportunities, deprecate the tremolo and other national faults of style, but are obliged to resign themselves to them in most cases. Signor Vidal is a teacher unconnected with the Conservatory, whose work commended itself to me inmost respects." "What do the French aim at in singing?" "There is less of the exaggerations of style than in Italy. Of course in a large house like the Grand Opera at Paris the main thing is for the singer to make himself heard, and in that case there may he some tremolo and exaggeration. In small halls and private lessons I heard fine singers and very little tremolo, while in Italy I heard all the objectionable points in private as in public. The French ideal is for exquisite finish. Their singing is consistent with what we know of their character in other things. In Paris I had introductions to Signor Delle-Sedie, and MM. Massenet and De Beriot, who honoured me with a charming courtesy, and gave me valuable assistance. Following the advice of these gentlemen, I obtained official permission to go to any class I liked at the Conservatoire. 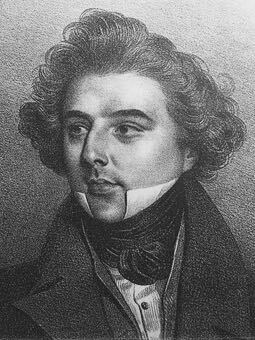 In the Opera Comique, I heard M. Clement, a young tenor of great excellence, who is coming to London soon. I should say that in him you will see a fair specimen of the prevailing French taste in singing. I was curious to know what was the authentic manner of treating nasals in singing French words. The professors say that the nasal is in the language and must be sung without modification. This I was sorry to hear, for it results in compelling good singers to make some distressing sounds. There are in Paris frequent recitals of pianists and vocalists who wish to come before the public which are usually excellent performances. A benefit performance, a matinee with forty or fifty items on the program, and lasting from two o'clock until past seven, gave me a panoramic view of French musical taste at all grades. There were artistes from the Grand Opera, the Opera Comique, concert-room vocalists, variety hall singers, and specialists, such as those who sing the old-fashioned songs in costume of the time. There was at every grade the same exquisite finish." "Where have you spent the longest time?" "Would you recommend people who want to imbibe music to go to Munich '"
"They cannot do better. Everything in a musical way can be heard there. There is a constant succession of excellent concerts, and good seats may be had from 9d. upwards. For any concert one is extravagant in spending 5s. or 6s. for a seat. For certain performances of opera, however (the summer Wagner festival), the prices may be as high as in London; but during the rest of the year all operas may be heard from the gallery for a shilling. Kheinberger's influence is great. Americans go to him a great deal, and I heard delightful performances from his school. The teachers in Munich are superior and their prices are lower than in the other large German cities." "What voice trainers have you met in England?" I also profited by the professional services and personal kindness of Mr. Shakespeare. I was pleased with what he told me, and found him very careful in the treatment of voices. Mrs. Behnke and all she had to say of her work was also very interesting. Sir George Grove received me most kindly, and introduced me to some of the professors who were at work at the Royal College. Signor Visetti favoured me with an invitation to a brilliant reception at his residence, where were many celebrities. The new building about to be occupied by the Royal College is a remarkably beautiful and commodious home for musical instruction." "Have you heard much church music?" "I have followed it with interest. At Munich the Protestant church music was amongst the most affecting I have heard. The chorale singing by the congregation was such as I have often enthusiastically described. Without any lead except that of the organ, it was most inspiring. In the Catholic churches I heard mostly unaccompanied motets of the old classical school. But German organs are unutterably bad. I do not wonder that unaccompanied singing prevails. I happened to be in Milan when they celebrated the 100th anniversary of Palestrina's birth with an especial musical service at the cathedral. The most aesthetic church music I heard was at St. Sulpice, in Paris, where Wider presides. It was a skilful mosaic of the best things ancient and modern. But to my taste the best of all is the church music ok England. In this country the kind of music,' the excellent smoothness of the singing, and the appropriateness with which the music is introduced into the service, all strike the American, who often sees heterogeneous music dragged into the service at home. In England the music is an integral part of the service. Besides musicianship, there is sincerity in it, something which moves you. I should much like to have a largo library of the best compositions for the English church; it would prove a mine of treasures." "How did you like the school singing at the Fleet Road Board School?" "That is very comprehensive musical work; it would appear that nothing had been neglected. The musical attainments of the children seemed of the permanent, thorough, and durable sort. The voices were good, showing correct training. The children's habit of thinking pitch accurately in its relationship to key (ear exercises) was bright and clear and quick. Their analysis of rhythm was also clear and decided. As a voice-trainer I do not like to hear a third part in children's singing. By singing below their average compass the altos lose the ' normal' voice." "What kind of vocal exercises prevail on the Continent?" "Not one teacher in twenty, so far as I heard, used the exercises which usually come first in the old methods, the sustained tone, the swell, the use of the portamento. Occasionally a more word would be all the reference made to these things. Sometimes the exercises wore successions of syllables to different vowels with consonants or glottis attack. But most of the work is with runs; sometimes a trill exercise is introduced, often scale passages, or an arpeggio, or chordal phrase widened in compass with each repetition. It seems as if opinions in the matter of voice-culture had radically changed." So Mr. Root continued to give his impressions of European musical matters in his genial, level-headed way, and we regretted that it was the eve of his departure, and must say good-bye. 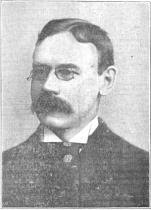 Root further clarified his teaching in a subsequent article in The Musical Herald, November 1, 1894. "The Delsarte normal tone, viz. : the voice that is, so to speak, hung in the middle or balanced, a tone that is neither clear nor sombre, but between the two, one that is freed from throat, jaw, or tongue interference, and one that vibrates clearly and brightly, as though it were from a sounding-board, this normal tone has a sensation of control or vibration in the head behind the nose, and thus we are shown which, among many, is the proper place to locate the tone for voice development. The eccentric tone, which nearly corresponds to clear timbre, may locate sensations elsewhere, and the concentric tone, which, in a degree, is the same as sombre timbre, is attended with still different sensations. "Both of these timbres are required for expression; but a part of the luminousness of the Delsarte classification is to show that, for voice culture, these are of very secondary importance instead of being of the prime importance which it has been the custom to assign them. The fundamental formula of vocalisation is, (1) keep the diaphragm vitalised (also a Delsarte term); (2) keep the jaw and tongue devitalised; (3) find the sounding-board. This gives the normal tone, and the normal tone is the key to the whole situation—to power, quality, compass, agility, evenness, shadings, attack, intonation, and even enunciation." Great to see Frederic Root on this blog. I did my dissertation on Root's pedagogy, and I love the way he was so descriptive and thorough. Thanks for sharing this here!